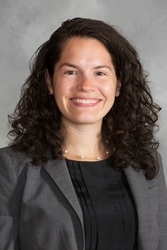 Cassi G. Martin is counsel in the Yardley, Pa. office of Hill Wallack LLP, where she is a member of the Workers’ Compensation and Intellectual Property practice groups. Ms. Martin concentrates her practice to the defense of employers, self-insureds and insurance companies against workers’ compensation claims. Ms. Martin is admitted to practice in the states of Pennsylvania (2010), New Jersey (2011) and New York (2012). She earned her J.D. from Fordham University School of Law, and is a graduate of Marist College. While attending Marist, Ms. Martin served as Editor-in-Chief of The Circle, the Marist College student newspaper. Ms. Martin also served as a Law Clerk for the Honorable Jeffrey L. Finley, presiding President Judge of the Bucks County Court of Common Pleas. Ms. Martin successfully represents both large and small corporations in a variety of matters, including occupational disease, specific loss and amputation, subrogation, psychological, and medical utilization review claims at both the trial and appellate levels. She assists clients in the development of claim reduction strategies and implementation of loss mitigation tactics. Her focus is on limiting her client’s exposure throughout the claims’ process.